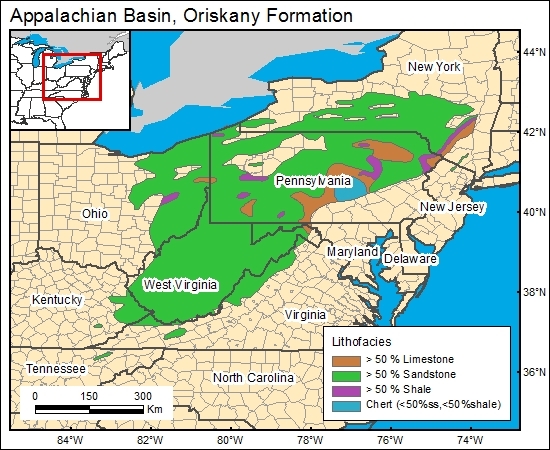 There currently is no published Oriskany Sandstone net-sand-thickness distribution for the region, although there are numerous reports showing local sand-thickness distribution (related to hydrocarbon exploration). There are numerous geophysical logs available for the Oriskany Sandstone interval, from which net-sand-thickness distribution can be accurately mapped (Asquith, 1982). Diecchio and others (1984; their fig. 4) presented a map showing general distribution of lithologies (>50 percent sand, >50 percent shale, >50 percent limestone) and formation thickness for the Oriskany Sandstone horizon; their map was used to characterize net sand thickness.